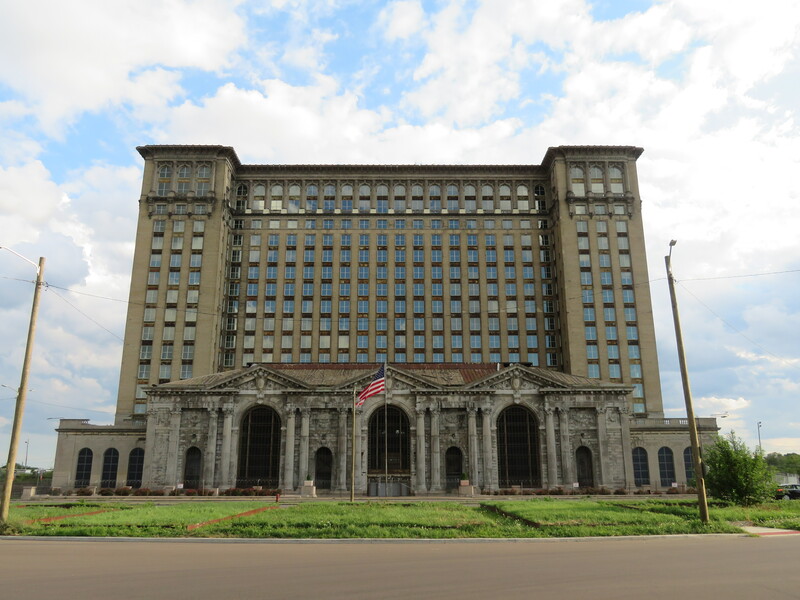 Thirty years after the last Amtrak train pulled out of Detroit’s now notorious Michigan Central Station (MCS), Ford Motor Company has confirmed the purchase of the structure from longtime owner Matthew Moroun. Crain’s Detroit Business first reported Ford to be in possible negotiation to purchase the 1913 Beaux Arts passenger station in Corktown in March 2018, but could not provide details on the sale. In a press conference in front of the station’s colonnaded entrance on June 11, Moroun announced that the Ford Motor Company would act as developer, owner and user of the landmark structure. Ford is expected to detail its plans for the building on June 19. The three-story depot with attached 18-story office tower has become a convenient symbol for Detroiters and preservationists to both criticize the city’s development practices and celebrate the ability of its unique as-is built environment to inspire the cultural class. Michigan Central Station has born witness to the complexities of Detroit’s 21st century narrative, particularly in Corktown. MCS sat idle as the last game was played at Tiger Stadium in 1999 and finally demolished in 2009, just as Major League Baseball stadium owners were figuring out that fans preferred an authentic urban experience around their ballparks—bars, restaurants and neighborhoods—over convenient parking, a scenario that had naturally occurred in Corktown. As new development crept east along Michigan Avenue, it began to encircle MCS. In 2015, the building mysteriously received new windows and a freight elevator, and in 2017, it hosted “Detroit Homecoming,” an invitation-only event that filled the graffitied, Roman bathhouse-inspired waiting room with banquet tables and former Motor City expats in an attempt to lure possible investors. MCS is no stranger to redevelopment plans. A casino was proposed in the building for the first time in 1989, with former Mayor Kwame Kilpatrick proposing to reuse the structure as headquarters for the Detroit Police Department in 2003. Armed by the 1984 Dangerous Building Ordinance, the City of Detroit moved to demolish the structure in 2009 using federal economic stimulus money but was prevented from doing so based on the MCS’s listing on the National Register of Historic Places.